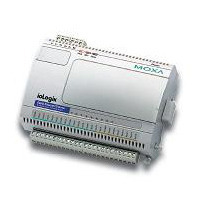 Moxa's ioLogik E2242 is tailor made for use with remote monitoring and alarm systems. This Active Ethernet I/O product provides 4 analog inputs and 12 configurable DIOs in the same product. The 1:3 ratio of analog to digital IOs is perfectly adapted for water tank monitoring and environmental monitoring applications, in which 1 analog input is used to trigger 3 digital outputs as High-High, High, and Low alarms. Moxa's ioLogik E2242 lets you set up your monitoring system without the need for a local PC or RTU.